It is the easiest method to check for nofollow tags. This method requires that you are using Firefox browser. First install SearchStatus add-on to your Firefox browser. After installation, restart your browser. Now you can see a SearcgStatus icon on the status bar. 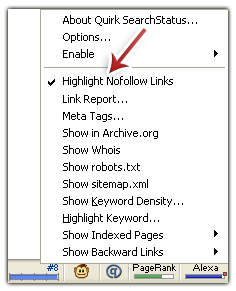 Right click on this icon and click on Highlight Nofollow Links. The add-on installing method is easy. And instead of doing your first method one can simply select the text he/she wants to look for the nofollow tag and right clik the text to view the source and can find out the tag if any. This will certainly reduce the strain to go through the whole code of the page. Hey adding my 2 cents to it, you can also use SEO plugin for Firefox which is very handy to show all the nofollow and dofollow links along with ranking of websites. Not bad for someone who has it so far up there back end. This is a fabulous publish, im thankful I ran across it. Ill be back again later on to check out other posts that you have on your blog. Superb post. I have seen many posts, but the posts rarely give away the kind of quality information that your blog do. thanks for the awesome tips. Help me cleared some of the stuff up. .-= reusch goalkeeper gloves´s last blog ..Soccer Goalkeeper Glove Size =-. Gotta love how many useful plugins Firefox has.